The Tribal-Class Destroyer H.M.S Eskimo was laid down 5 August 1963; launched 3 September1937 and commissioned 30 December 1938. She was severely damaged during the 2. Battle of Narvik in 1941 where she lost her bow. After that HMS Eskimo served with the 10th Destroyer Flotilla in Plymouth and participated in Operation Torch. During Operation Husky she was damaged again, this time by German dive bombers. On 24 June 1944 she corned and sunk the German submarine U-971 north of Brest together with the Canadian Destroyer HMCS Haida and a B-24 Liberator from the Czech Air Force. The Ship spent the last days of the war in the Far East. After the war she served as a headquarters and accommodation ship for mine sweepers and salvage vessels. She was then used as a target ship and eventually sold as scrap in 1949. Since I am an armor modeler by heart I am entering new waters with reviewing a ship model. So I apologize upfront in case I use the wrong terms. This kit comes with 7 grey sprues containing more than 200 parts and a full hull. There is no option for a waterline model like Trumpeter usually offers with their 1/700 scale kits. All parts look nice and have crisp detail. Ejector marks are hidden and there is no flash on the parts. Some o the round parts have a little parting line that will require some cleanup. A PE-Fret with 44 parts is also included. There are some PE-Railings for the upper decks but none for the main deck. Other PE-parts included are gun shields for the AA-guns, ladders, anchor chains, and grates for the funnel caps. The small decal sheet has the hull pennant numbers and two White Ensigns. All decal appear in register with good colors. The paint and marking guide is in color and shows the ship starboard, port and above view. Paint references are given for Mr. Hobby, Vallejo, Tamiya and Humbrol. The paint scheme is the Western Approach scheme as I was told by a fellow modeler. This is a nice and solid model were even a ship newbie like me shouldn’t have much of a problem. Only drawback in my opinion is the lack of railing for the main deck. But with so many companies offering AM railings it shouldn’t be too much of a problem to add the missing railing. 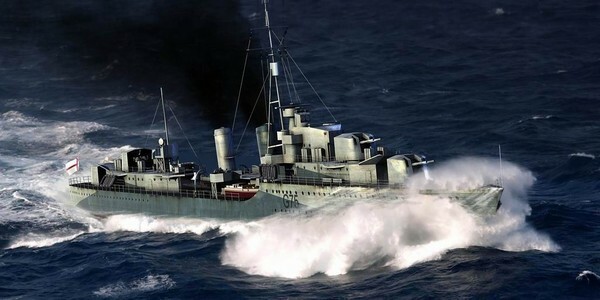 This model represents one of the major destroyer types used in WW2 that is a nice addition to every ship model collection. I would like to thank Stevens International for this review kit.